This year for Christmas we tried to give a gift to each grandparent "from Will". Will was featured in some way with either a photo, handprint or footprint and while I can't say he really helped (he seems to become extra squirmy when we want him to be still) he definitely was involved so we are claiming as a success. 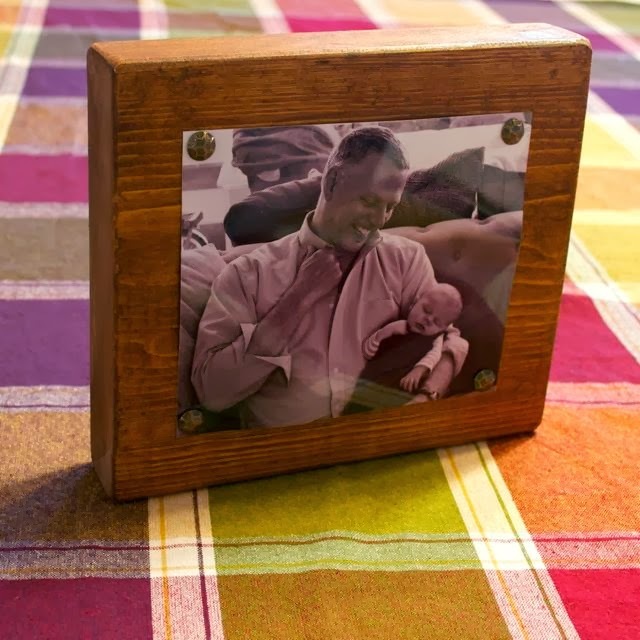 For my dad, I decided to make a pseudo picture frame. I ordered one of my favorite photos of Will and my dad in black and white and cut it down so it was square. Once I had the dimensions of the photo, I found some wood in the garage that would be bulky enough to stand on its own edge and be large enough to give a nice border around the picture. I cut it to size, sanded it down, stained and sealed it. Once it was all dry, I took some fancy nail heads I had and used them to secure the picture to the wood. On the other side, I got brave with some paint. I'm still surprised I was able to paint Will's feet, get two fairly decent footprints on the wood in a reasonable heart shape and get him cleaned up without getting paint everywhere. (On a side note, Will's daycare is always doing these cute paint projects with them and I'm always super impressed and a little disappointed I can't get anything to come out nearly as nice... then I remember that there are 5 teachers, aka 10 hands, helping with these projects and I feel slightly less bad about my slightly messy 2 handed projects). 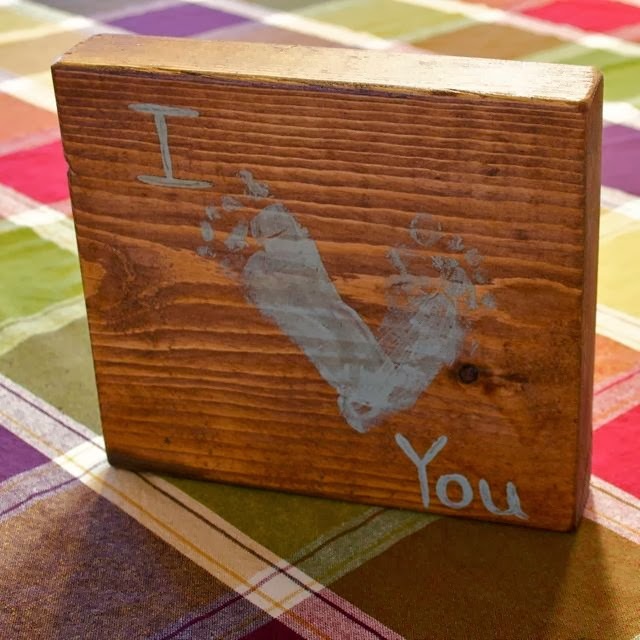 After cleaning Will up and setting him up in his highchair with a snack, I add the "I" and "You" with the same paint. Another day of drying and I had a rustic unique picture frame with a personal touch. I really enjoy these types of personal projects and I think they will become even more fun when Will can participate a little more.